Jane Doe No More was founded by Donna Palomba in 2007, and is working to improve the way society responds to survivors of sexual assault through education, awareness, advocacy and support, according to its mission statement. Palomba states on the Jane Doe No More website that she founded the organization as a result of her own experiences as a victim of sexual assault. Tracy Blackman, the education coordinator for the organization, led the meeting and brought three sexual assault survivors who graduated from their Survivors Speak Training program to tell their stories. Blackman explained that Palomba had been raped at gun-point in her home, and the case became very public because of the way she was treated by law enforcement and the media. However, Blackman explained that as Palomba started to recover from the trauma she suffered, she wanted to come out and say that she would be Jane Doe no more, and she would speak out against sexual violence and help other people move on from their experiences with it. Blackman said the goal of Survivors Speak Out is to make the prevention of sexual violence and re-victimization personal. “It’s personal in that we’re sharing our own personal stories with you of being survivors and personal in that I’m giving you empowerment to make a difference in helping us to reduce the statistics,” Blackman said. The three survivors that spoke at the event were Brad Hotchkiss, Patti Ieracl and Mary Taylor, who are all victims of childhood sexual assault. Sophomore Abby Marton described hearing the survivor stories as eye-opening. In her presentation, Blackman covered sexual violence statistics, what sexual violence is, what the red zone is, healthy and unhealthy relationships, consent, respect, bystander intervention and what to do if it happens. Sexual violence on college campuses is alarmingly prevalent and statistics show that one in four women and one in nine men will be sexually assaulted in college, according to Blackman. She also talked about the red-zone, which pertains to the first few weeks of the semester and it is the time when most sexual assaults tend to occur on college campuses. When students are away from home and experiencing the freedom of college for the first time, they are more exposed to perpetrators. Senior and president of the criminal justice club Michael Siena said that this is the third year Jane Doe No More has come to speak at their sexual violence prevention talk. In 2015, when Siena founded the club, he came into contact with Blackman after hearing about their work with college students. 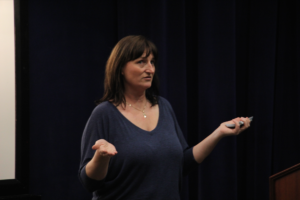 This year’s sexual violence prevention talk had the best turnout, according to senior and secretary of the criminal justice club Karee Helgerson.